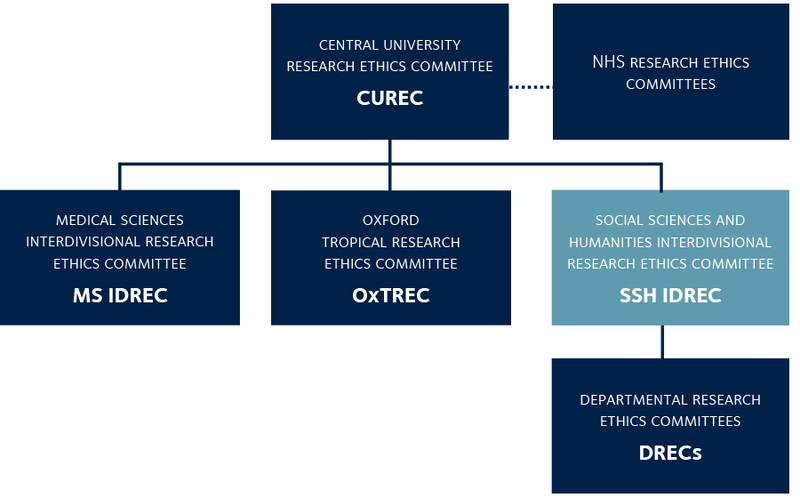 The Social Sciences and Humanities Interdivisional Research Ethics Committee (SSH IDREC) is one of CUREC’s three subcommittees. The SSH IDREC delegates review of straightforward applications (CUREC 1As) to the SSH IDREC Secretariat or ratified departmental research ethics committees (DRECs), where appropriate. This means the full SSH IDREC committee only reviews CUREC 2 applications. The committee is constituted in accordance with the University regulations on CUREC subcommittees (Part 13 of Council Regulations 15 of 2002). These regulations, in conjunction with the SSH IDREC standing orders, detail the remit of the committee, their responsibilities, requirements for quorum, and requirements (for the committee and researchers) for record keeping and audit. The committee includes members from a range of academic and non-academic disciplines. Some members are internal to the University and have academic positions. Of the academic members, some are 'research active' but others are not currently involved in research with human participants or personal data. The committee also has external lay members who bring valuable expertise and perspectives from non-academic and non-educational sectors. In this way it is hoped the members together reflect the interests of researchers, participants and third parties. Appointed members serve for four years and are re-eligible. For full details of committee membership requirements, see Part 13.8 of the Council Regulations. Please note: any queries about the committee should be sent directly to ethics@socsci.ox.ac.uk and not to individual members. Two persons appointed as chair and vice-chair of the subcommittee by the Research and Innovation Committee of Council, ideally one of whom shall not currently be involved in research involving human participants or personal data. One of the persons appointed as chair or vice-chair may be external, but not both.